The Mode feature controls how site visitors interact with your Beacon. You can guide 'em to get in touch right off the bat, or encourage self-service first, or let them choose their own adventure by displaying both options side-by-side. See help articles first, contact options second. Beacon opens in the Answers screen, and it’s not possible to move to Ask without interacting with the content. The customer must run a search, or open a help article and leave a negative rating, and contact options will then appear. See both help articles and contact options side by side. 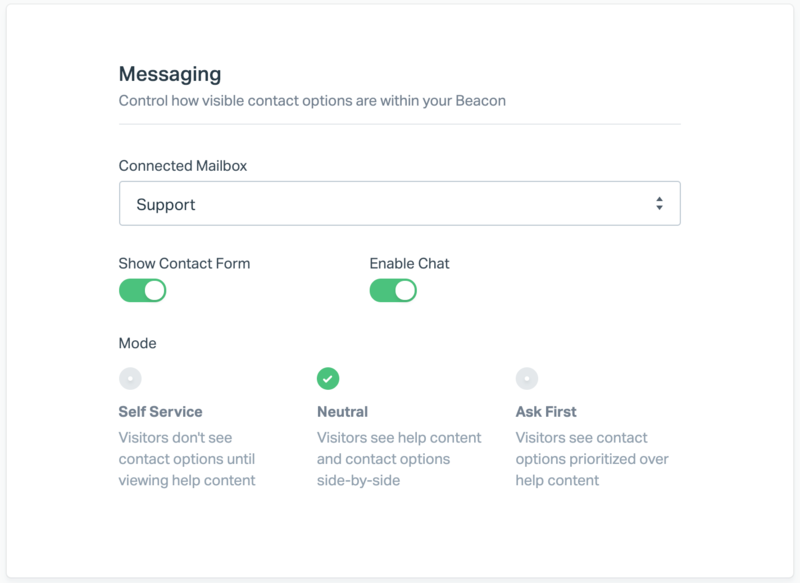 Beacon opens in the Answers screen, and customers can move to the Ask screen at any point. See contact options first, help articles second. Beacon opens in the Ask screen, and customers can move to Answers at any point.